Did you ever wonder why some insects can walk on water? Or how the Ancient Egyptians made mummies? Are you curious about why a guitar sounds different from a flute? 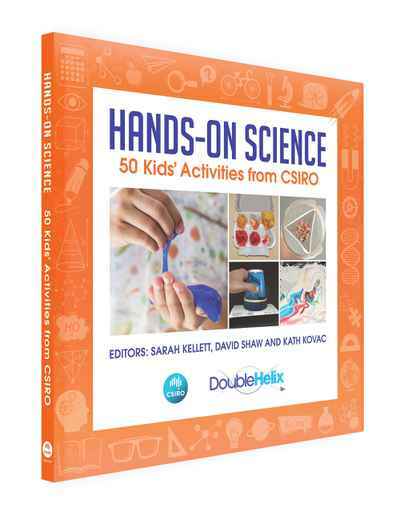 Gather some everyday materials from around your home and find out the answers with these 50 kid-approved science activities from CSIRO. The activities cover electricity and magnetism, sound and light, heat and motion, water and gases, living things, shapes and our planet Earth. Each activity has a simple list of materials required, and uses simple step-by-step instructions and drawings to enable you to create exciting and interesting reactions, experiments and inventions. Fast facts and quiz questions will help you test your knowledge, and you’ll also find an explanation of the science behind each activity, along with examples of how each principle works in the real world.